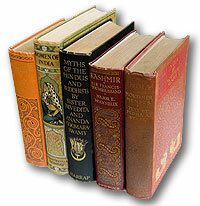 We are booksellers specialising in the Indian Sub-Continent and Central Asia, founded in 1992, mailing worldwide. At any time we hold a stock of about 7000 items on South and Central Asia which can be searched through this website. From time to time we produce printed catalogues, sent free on request, of new acquisitions and on a variety of topics. We aim to provide both rare and valuable items and a full range of inexpensive books covering as many varied interests as possible. There is no stock of new books. We are always delighted to meet visitors in Sherborne but if you wish to visit the bookrooms make sure that you make an appointment as we are often away finding new stock and don’t try to keep shop hours. We cover a very wide range of topics including large collections of fiction set in India, all aspects of the work of Rudyard Kipling, and of Himalayan mountaineering. Should you wish to order, please be sure to confirm that the book is still availabile and agree a method of payment. We do not have our own credit card facility but online payments can be made through www.paypal.com. UK customers usually pay by cheque.